Handpainted clown playing the bajo. This one is in a grey suit with red dots. 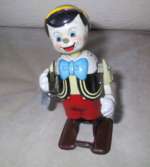 Wind up toy with "pling plong music". Güntherman ca. 1905.Only minor chips to paint on figure, but nothing major considering the age. The function is great- wind up key attached. No repairs.An excellent piece for the collector of early rare toys. H. 7" /17,5cm. Piano player made by Martin, France. 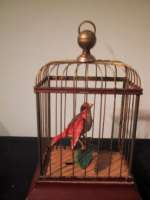 This is a wonderful toy from ca 1910. When he is wind up he actualy plays and moves his fingers. Great original conditin all over.Dressed in felt. Original wig. A great piece for the Martin collector. Size 5" 14 cm. Japanese pre-war mechanical toy. ca 1930. Rare piece. Boy feeding hen. All original!Great Litho. Wind up toy. Excellent condition all over.Wind up. Working fine. Pinocchio walking. Old tin comic/movie toy from Line Mar,USA,Walt Disney, tinplate. Clockwork. Great Litho. Size 6" / 15 cm. ca 1940. Very fine condition. 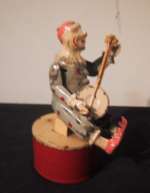 Great piece for the comic or Disney collector.The figures arms and legs move when the toys is wound.Film. !9"/ 48 cm Alt Beck and Gottschalk doll with closed mouth. She is an early German doll with a great moddelling ca 1890. Lovely face with find meodelled details. lovely large blue eyes, pretty deep modelling of her face. The bisque is just wonderful with no spots or cracks. She has her original wig. Her body is the original jointed kid body, with bisque lower arms. 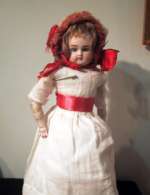 She is wearing her old white swiss cotton dress and and wonderful bonnet trimmed with red as her dress. Lovely underwear and shoes. A doll in a wonderful size, that would be a fine addition to your collection of good bisque dolls. Wonderful early Biedermeier desk. 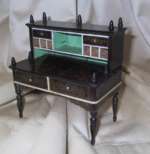 A rare seen desk from circa 1860.This is a very rare piece of stencilled biedermeier. The top of all the biedermeier desks! It has thas drawer and doors to open-a gallery above for your writing utensils. Great stencilled all over. Tke a look at the way the gallery is stencilled-so much more detailed, than you ever see. Wonderful decorated with a mirror in the middle. The rosewood is lined with the white, to simulate bone. A beautiful piece to add to you early house. The size is for the medium dollhouse. about 1:10. Condition is excellent all over. No repairs or retoration.